Living in a year-round tourist cycle affects the local lifestyle and philosophy. Sochi natives are hospitable and friendly. One may work in a sanatorium, another may run a small hotel or restaurant on the seashore, yet another may drive tourists on excursions. The locals have grown accustomed to the singular resort lifestyle. Even Sochi’s year does not start in January, as it does everywhere else in Russia—it starts in May, when the city’s leader kicks off the new resort season. Most of the visitors who head to the Black Sea coast to relax are Russians from all corners of the country. Despite the fact that it is now much cheaper to travel to Turkey or Egypt, Sochi, the “pearl by the sea” has its solid contingent—people who hold tickets on group tours with budget organizations, and companies that have their own pensions on the Black Sea coast. There are politicians, bureaucrats, employees of large industrial enterprises such as Norilsk Nickel, Russian Railways or the tax police. There are also people who are barred from traveling abroad: workers in industrial defense firms, who have access to classified information, and soldiers. And of course, there are also people who are simply avid devotees of Sochi—those who journeyed to Sochi during the Soviet era with their parents and would run around the beach naked but for a hat. For 24 years, Russian and foreign theater and film stars have been descending on Sochi for Kinotavr, the reigning national film festival. In the autumn, the city hosts the International Investment Forum. City residents are now waiting for the Formula 1 track to open. Sochi natives can in no way be called a shining example of Russian culture since Sochi is home to representatives of more than a hundred nationalities. 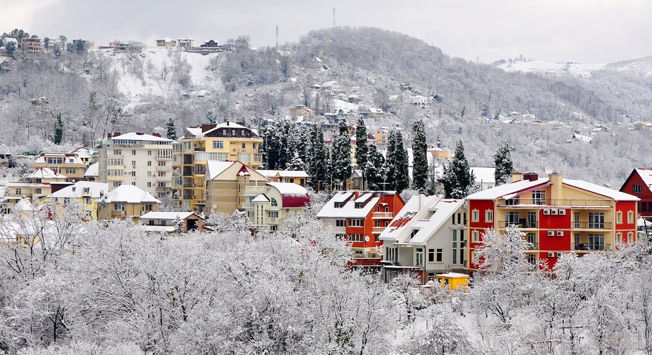 Sochi has long been a melting pot of everything: languages, cultures, cuisines, customs, and holidays. Most foreigners think that the citizens of the CIS countries “all look the same,” but this mixture of “small peoples” creates an unforgettable color that can be felt even by a visitor who cannot tell a Georgian from an Abkhaz or a Ukrainian from a Belarusian. So at the market beyond the shop with the Abkhazian mandarin oranges can be found a picturesque Georgian who is speaking Russian. In the store, every other shopper needs to buy Armenian lavash, Adygei cheese and Georgian-style sauce. Only Sochi natives know that these three ingredients can be whipped up into a surprisingly tasty dish that requires only some herbs. Bargaining is acceptable in Sochi’s markets. A merchant might get insulted if you immediately agree to his price—try to play the game. Keep in mind that the bargaining is often factored into the price, and the merchant is prepared to sell his item for 20–25 percent less. If you have not mastered the language, use a calculator. Punch in a price you like and show it to the merchant. In many stores, restaurants and even taxis, there are machines for noncash transactions. But be sure to have cash on hand when you go to the market or to a mountain village. There are ATMs all over the city center.